Mcrtchly and I have just returned from Italy where last Sunday (25th April) we climbed the highest peak in the Apennine Mountains, Corno Grande's west summit (2912m). It was the last day of the official skiing season and the 9.00am cable car that goes up to Campo Imperatore (2130m) where the climb to Corno Grande begins was crammed with people making the most of a glorious spring day. We decided to tackle the summit via the Direttissima route classed as PD (not very hard) involving the ascent of a snow gully above Sella di Monte Aquila (2335m). There was still an abundance of snow above the cable car station and we had to undertake a long traverse and climb a steep section over a cornice to access the ridge sweeping away towards the foot of Corno Grande. The Direttissima was not technically difficult, with granular snow at about 45 degrees and a few steep icy patches to overcome. Luckily we felt no ill effects from the altitude and both thought that we had done gullies that were far more difficult back home in Ireland this winter, which just goes to show that even though our mountains are not as high as those in other countries, under the right conditions they prove to be every bit as challenging and exciting to be in. 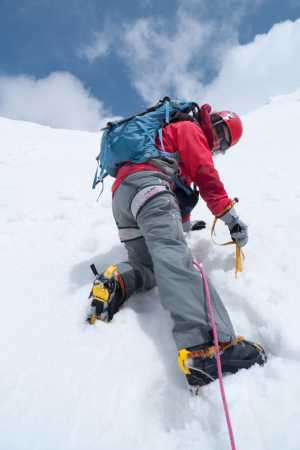 After summiting we chose the Canalone Bissolati as a descent route, which is located about 50 metres west of the summit. This gully leads straight down to the Campo Pericoli slopes and was much longer and steeper than the Direttissima. The hot weather meant that the snow was very granular and prone to slippage, so we had to downclimb it. Corno Grande is a mountain well within the capabilities of competent winter climbers and you do not need a guide. It can be done within a day, but anyone contemplating it should be mindful of the time of the last cable car down. We were hugely relieved to just make the last car at 5.00pm, as the 1,000m walk down to the car park would have been too horrible to contemplate!